Edward Albert Christian George Andrew Patrick David, 1894-1972. King Edward VIII, 1936; Duke of Windsor, 1936-1972. 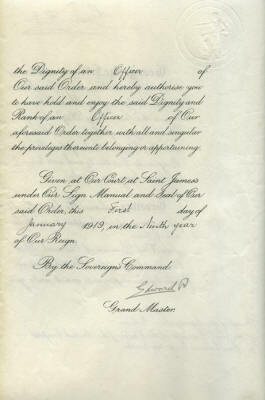 Document Signed, Edward P, by Edward, then Prince of Wales, in his capacity as Grand Master of the Order of the British Empire, given at the Court of St. James's, January 1, 1919. 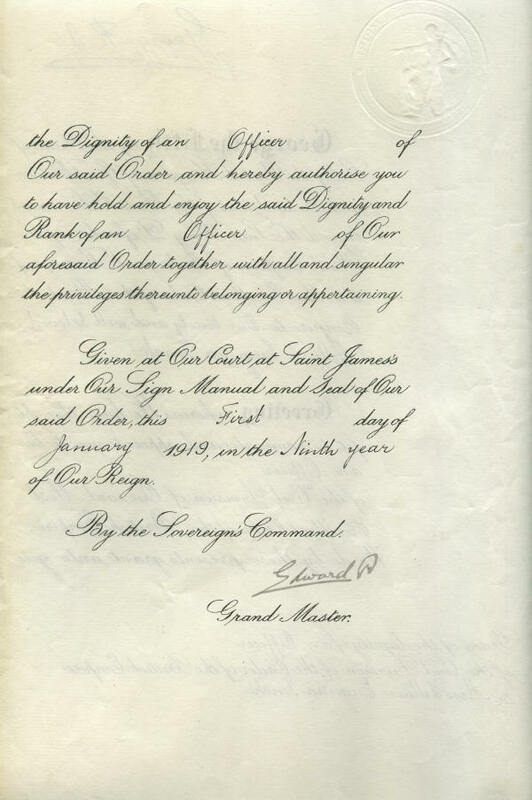 The document is also signed in facsimile by King George V.
This document confers on Miss Lillian Eugenia Tench "the dignity of an Officer of the Civil Division of the Order of the British Empire." 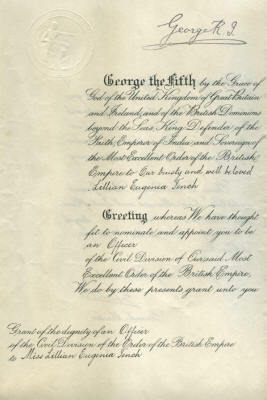 King George V created the Order of the British Empire in 1917 to recognize the many people helping, both as soldiers and as civilians, in Britain's effort during World War I. For the first time, women were included in an order of chivalry. Beginning in 1918, the Order was divided into Military and Civil Divisions, the latter to acknowledge distinguished service to the arts and sciences, public service outside of the Civil Service, and work with charitable and welfare organizations. 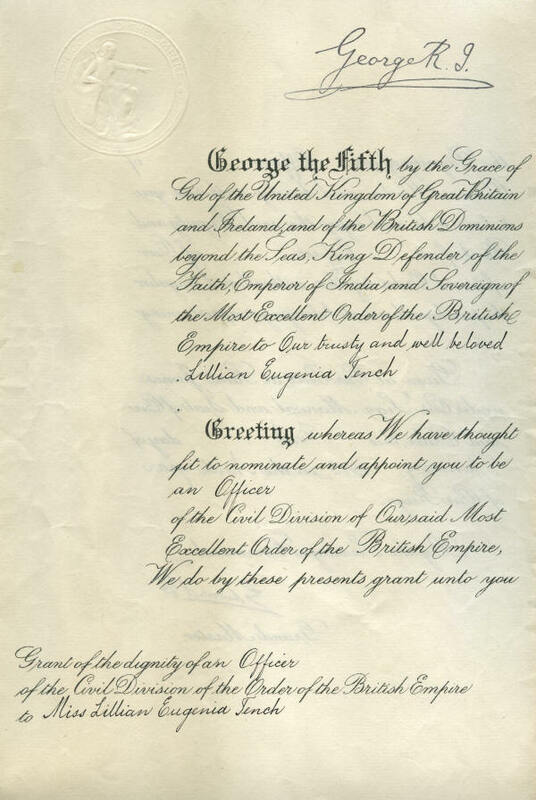 Today the Order of the British Empire is the order of chivalry of the British democracy, and valuable service is the only criterion for the award. Edward, the son of King George V, was wildly popular across the British empire as Prince of Wales. He acceded to the throne as as King Edward VIII on January 20, 1936. Soon he made clear his intention to marry Wallis Warfield Simpson, an American divorcee who was then seeking a divorce from her second husband. Wallis was unacceptable to the British government, and in particular Prime Minister Stanley Baldwin, whose government rejected the King's proposal for a morganatic marriage. Faced with choosing between Wallis and the throne, Edward abdicated on December 11, 1936. “I have found it impossible,” Edward said in his farewell broadcast to the British people, “to carry the heavy burden of responsibility and to discharge my duties as King, as I wish to do, without the help and support of the woman I love." Edward was succeeded by his brother, Albert, who became King George VI. The new king granted Edward the title The Duke of Windsor. Edward and Wallis were married at Chateau de Candé in France on June 3, 1937. The document is printed on both sides of the front leaf, and it bears a blind-embossed seal.  The blank integral leaf is attached. Edward has signed boldly in gray ink. The document is in fine condition.